The incipient climb at the end of the previous stage maintains its presence at the beginning of this long day in which the walkers will reach one of the rooftops of the French Way. 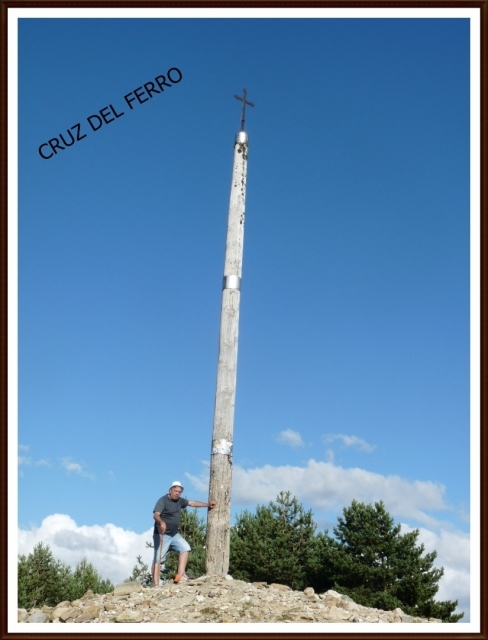 La Cruz de Ferro, all its symbolism awaits and encourages them to continue the legendary custom of depositing a stone at its base to achieve protection throughout the itinerary. After crowning the hill Irago and admiring the dramatic landscape, alternating between the vast plains of the plateau and the lush vegetation of the mountains, the walkers begin a rigorous, abrupt and steep descent, which in some sections causes a sensation of vertigo, this steep climb lasts for almost 15 kilometres through the mountains of Leon and will test the muscle resistance and endurance of any pilgrim. The beautiful villages on route, of which some are only kept alive thanks to the passage of the Camino, have the necessary infrastructure to provide basic services to the pilgrims. The charming Molinaseca can be the perfect place to end the stage especially for those pilgrims who want an escape from urban towns. The last stage of the day leads the travellers to Ponferrada along deceiving terrain, which appears flatter than it really is. This beautiful mountain stage, of moderate difficulty, begins in Foncebadón (234 kilometres to Santiago), a town that saw a decrease in population in the 60s as residence moved to more populated locations and only experienced a resurgence with the recent success of the pilgrimage route. This stage begins along what remains of the paved Calle Real, on which there are three hostels and the parish church, dedicated to St. Mary Magdalene. Leaving on the left hand side the ruins of this shrine they continue on a rocky path that runs on the left side of the mountain. Gradually, and almost without realizing it gains altitude until joining, about a kilometre later, the LE-142, the road that has served as the main route for cyclists since leaving Foncebadón. Hikers cross the road and continue the trail on deceiving terrain, surrounded by heather, until reaching Cruz de Ferro (25.6 Kilometres to Ponferrada), one of the most emblematic places on the pilgrimage route. Located 1,504 meters above sea level, it is possibly the simplest yet most emotive monument of the entire route, constructed from a wooden post about five meters in height upon which there is an iron cross, a replica (of 1976) of the original one conserved in the Museum of the Caminos in Astorga. This monument may have been put in place by the French-born hermit Gaucelmo, a contemporary personality as related to the Camino as Santo Domingo de la Calzada, San Juan de Ortega and San Lesmes of Burgos. Gaucelmo dedicated his life to helping the pilgrims cross the difficult passage along the peak of Foncebadón and possibly placed this cross to indicate the route of the Camino when the heavy winter snow made it difficult for Pilgrims to follow. The cross is situated on the site where the Romans placed an altar in honour of the god of Mercury, protector of the Caminos. This site is known for the ancient customs of the Galician Reapers, Castilian herdsmen and for all the pilgrims who throw a stone (sometimes, brought from their place of origin) to its base to achieve protection throughout the difficult route. Thus, the cross has sustained a great number of stones that have accumulated over the centuries. Many pilgrims still uphold this custom. In 1982 the Galician centre of Ponferrada constructed, behind the cross, a chapel dedicated to Santiago. Also on this site walkers can see the well-known Pilgrim clock (sundial type), established in 2007, its instructions for reading the time are in written in Spanish, English, French and German. This obligatory pilgrim stop also provides an authentic view of the itinerary already travelled and that, which lies ahead. Another notable landmark is Mount Teleno, with more than 2,100 meters in height it dominates the sierra, which the hiker now abandons. The change of scenery while climbing Mount Irago is spectacular. For little more than 20 kilometres the pilgrim continues along the extensive central plateau. The Albergue Templario de Manjarín The Walker continues the Camino along a path parallel to the LE-142, on good ground that initiates the imperceptible descent. After passing another simple crossroad, the path narrows and moves away from the asphalt to proceed without any major incidents. 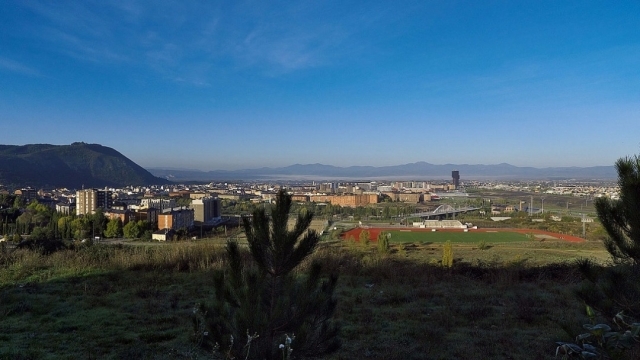 The trail comes to an area of asphalt just at the entrance of Manjarín (23.2 kilometres to Ponferrada), a tiny and deserted mountain enclave which once had with a hospital for pilgrims and where currently one of the most unique and famous hostels on the Jacobean route is situated. This Templar hostel is managed by the hospitable Thomas Martinez, an ex pilgrim who claims to have had a Templar calling during a stay in Ponferrada. The hard climb begins After leaving his job and personal life, he embarked, as others have in previous centuries to the order of the Temple, on a service mission to guard the long walk to Santiago. Thomas rehabilitated an old school and in 1993 opened it as a medieval style hostel, where the pilgrims will not find too many comforts or luxuries (there are no bathrooms or showers) although it is an energetic place where walkers can rest, and pray three times a day. Over the years he has become known for his habit of ringing a bell to the passing walkers while dressed in white robes with a red cross. Twenty years after its foundation, and with the help of other followers from the order of the Knights Templar, the hostel has become increasingly popular. The numbers speak for themselves, to date over 70,000 pilgrims have visited the hostel, according to Thomas, visitors are not surprised by the decor. At its doors pilgrims can buy different souvenirs related to the order and obtain a very particular Jacobean stamp. On their credential there is normally a cross, but on this occasion it is a Templar. After saying goodbye to the hostel, the pilgrims continue over a small stretch of asphalt, to immediately advance down a path that runs parallel along its left side. Meters later it narrows and heads back down a slope on a curved path away from the road along which, at times, the pilgrims might find a stall, next to a bench, that offers bottles of water in exchange for leaving a donation. After reaching the asphalt again, and always surrounded by wonderful views over the mountains of El Bierzo, the pilgrims join a track towards an abandoned military base its antennas serve as a reference point. After reaching the summit of Irago, a mountain of 1,515 meters in altitude, (except for those pilgrims who began their journey in Somport, its peak, in this case reaches 1,630 meters), it is referred to as the ceiling of the French Way. The pilgrims begin, along stony lanes, with considerable stone blocks and narrow passages, a descent that evokes vertigo but these kilometres have to be covered in order to reach the next stop. Cyclists who are not well prepared should avoid this path, given its steep slopes it has resulted in more than one accident. The road approaches El Acebo (16.2 kilometres to Ponferrada), the first village on the route in the region of El Bierzo. At the entrance, a cross and the chapel of San Roque appear to greet the travellers and they can also quench their thirst at the famous Fountain of Trucha (The fountain of Trout). The Jacobean past of this enclave and its historic service to walkers has made its residents deserving of certain privileges. Investigators claim that its inhabitants were exempted from paying taxes in exchange for placing 800 stakes to mark the route to avoid travelling pilgrims from getting lost. Formerly there was a hospital for pilgrims but it no longer exists. This charming mountain enclave, with typical slate roofs and wooden balconies, has along its main street an abundance of supplies for walkers (there is a large recently built hostel which can accommodate a number of pilgrims). After continuing the route, leaving on the left the chapel of San Miguel, inside it hides a polychrome stone sculpture dedicated to Santiago wearing a robe and decorated with lily flowers, from here walkers reach another of the most photographed monuments. The simple Monument to Heinrich Krause, it consists of a bicycle entwined with a walking staff and a pumpkin, erected on a stone pedestal in 1988. This monument is in memory of a German cyclist who died on this terrain while on the pilgrimage to Santiago. At the exit of the enclave the pilgrims leave on the left a turn off to Compludo and its famous blacksmiths, excellently restored, it has been declared as a national monument since 1968. Cyclists and walkers who want to visit this site need to travel five kilometres along winding slopes and continue for a few minutes on a trail that runs beside a stream. The pilgrimage route continues straight ahead on asphalt although sometimes is aided by a very narrow path that runs parallel along its left side. It descends rapidly to a large bend in the road, from which there is a diversion to the left that will take walkers to the next stop. On the road there is a sign warning cyclists that they should continue on the LE-142 to avoid the discomforts of other path on stone and earth taken by the pilgrims on foot, after a narrow entrance to the Calle Real, the hikers reach Riego de Ambros (Ponferrada 12.4 Kilometres). The route passes through the elongated village, guided by yellow signs located on the houses, they pass Plaza de San Sebastián, where the chapel of San Sebastián, the albergue and a fountain are located, and continue along Calle Camino de Santiago. It is here, and after an abrupt change of ground, where the pilgrims bid farewell to this enclave, along a gloomy path and enter a pleasant and beautiful descent, in which slabs of slate and some rocks of considerable dimensions can complicate the walk. Bear in mind that after periods of heavy rain this route can become very slippery. The route leads pilgrims to a meadow with a small stream, where the trail can become muddy, to later continue, on good ground, a dirt track amid lush vegetation and a beautiful forest of chestnut trees with simulating views over the surrounding mountains. With the noise from the road on the right, and guided by signs that are marked on the rocks, the pilgrims reach a junction with the LE-142 situated next to the Restaurant El jardin de Anduriña and enter, now on the right side of the road, another track that progresses parallel to some power lines until reaching some posts to take a path on the left. The descent becomes complicated and tortuous, with areas of loose slabs that hinder walking. In the distance the pilgrims are comforted the sight of Ponferrada in the distance. Having now descended from the highest point of the iconic mountains of Leon the hikers travel through the valley of Bierzo, where flat ground followed by a steep descent leads to a passage next to a small stream. They continue along a path that runs along the edge of a ravine, and after passing several curves, accompanied by intense aromas, the hikers begin to distinguish the roofs of Molinaseca and, in the distance, the LE-142, where the cyclists continue. After another steep descent they leave on the left hand side a turn off to the road, which the pilgrims do not take but rather they continue straight ahead on along a path with an arrow made of stones. Walkers pass a cross and, immediately afterwards, they arrive at an asphalt path. 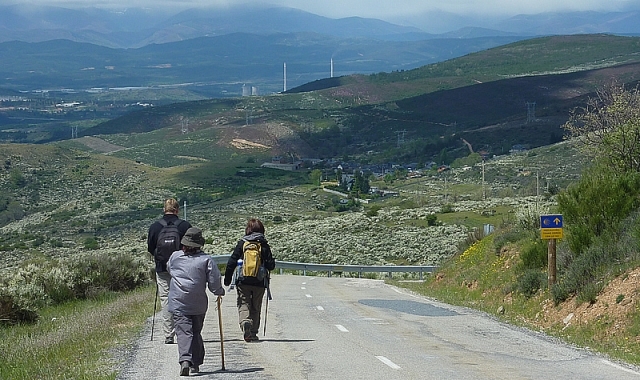 Now on the pavement, the walker is faced with an immediate slope to the entrance to Molinaseca (7.7 kilometres to Ponferrada), a charming town known as the "oasis on the Camino". Now at the entrance to the sanctuary of Angustias, its doors had to be protected with iron sheets because in the past devotees and pilgrims took with them small chips as a relic. The route crosses over the river Meruelo on a beautiful medieval pilgrim bridge and reaches the Calle Real, with its houses decorated with shields and flowers. On this road, the main artery of the town, hikers will find all kinds of services. The route leaves this village, which, in the middle Ages had a number of hospitals and acquired French and Jewish residents, departing along its wide streets Calle Manuel Fraga Iribarne and Pisón. After passing a long straight of successive lodgings and eating establishments the route lowers reaching a tennis court and joins a path that goes around the back of some houses and a meat curing factory. After changing to an earthy path the walkers return, a little later to the LE-142 to then turn left at a turn off that leads to a track of gravel and some tunnels. At a subsequent crossroads the route takes another path to the left and continues down hill with curves towards Campo (3.6 kilometres to Ponferrada). In this stretch there is a cross in memory of a pilgrim who died in 2005. Following another gentle slope the walker reaches the town of Ponferrada, previously it was home to some hospices until the first half of the twentieth century. Here the pilgrims can eat at one of the inns in the town and visit an underground fountain of Roman origin (to reach it they will have to deviate to a path on the right) and the parish church of San Blas, XVII century and situated on a hill. Now on asphalt and well sign posted, the walker continues along the riverbank of Boeza and passes new establishments and a driving school. The entrance to Ponferrada is more beautiful than access to other known cities. After crossing several neighbourhoods they reach the centre itself and cross the river Boeza to arrive at the grounds of the parish hostel. Pilgrims travelling by bike should take extreme care on this stretch of the route, it has been the scene of several fatal accidents involving cyclists. A monument at the exit of El Acebo reminds the pilgrims of this. 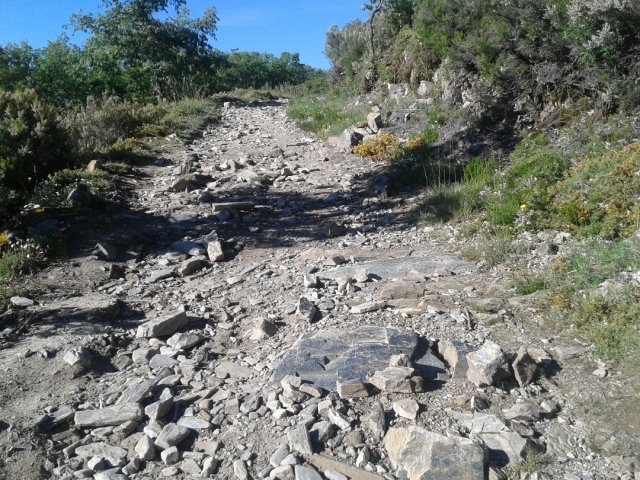 Those less experienced are recommended to complete the journey, until reaching Molinaseca, along the LE-142 road, taking extra care if the ground is wet. The itineraries most inaccessible for bikers are those that connect Manjarín with Acebo, the path that leads to Riego de Ambrós (signs on the asphalt indicate the way forward for cyclists) and the descent from Molinaseca. From this town cyclists can continue the official route to Ponferrada. Desde los 1500 msnm en Foncebadón, bonito y austero pueblo de montaña, hasta Molinaseca, la etapa no tiene desperdicio. Tras Foncebadón se llega a la singular Cruz de Hierro, y se va llaneando por pastos y matorrales de montaña hasta iniciar el descenso pasado el refugio de Manjarín. Durante el mismo, y con los montes Aquilianos y la Sierra del Teleno como telón de fondo, el paisaje es abrumador. Los pueblos: El Acebo, Riego de Ambrós y finalmente Molinaseca son a cada cual más bonito, los dos primeros estupendos ejemplos de arquitectura civil berciana de montaña, y el último una villa precedida por un hermoso puente y con una calle real de ensueño, al tiempo que alberga dos importantes santuarios. La única pega de la etapa es la aproximación hacia Ponferrada, casi siempre por carretera. Personalmente considero recomendable finalizar en Molinaseca y visitar tranquilamente el pueblo. Si bien en Ponferrada la visita al castillo templario es uno de los hitos, bajo mi punto de vista, imprescindibles del camino. Luego de la Cruz de Hierro, el Camino se pone un poco... áspero. ¡Qué lindo desafío es el Camino! 2 reviews Distance to Santiago: 234 km. 1 reviews Distance to Santiago: 222 km. 1 reviews Distance to Santiago: 218 km. 1 reviews Distance to Santiago: 214 km.